Yesterday my sweet guy took the day off from work to spend it with me thrifting. We hit quite a few stores, met up with Joy for lunch and did a little more thrifting. We had so much fun! Here are the goodies I found. 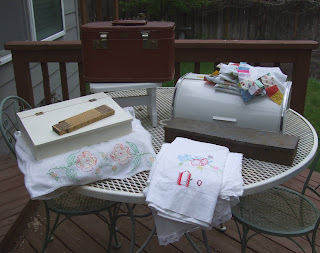 A little cosmetic suitcase, little white stool, white metal bread box, white lap desk, folding yard stick, linens, rusty metal box and quilt pieces. 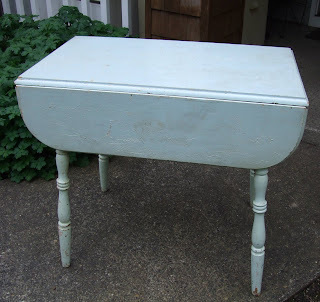 But my favorite find of the day was this light aqua table. When we walked into the thrift store that I found it at, the workers there said, "75% off on all kitchen tables." Well, I wasn't really thinking I would find a cute kitchen table there, but when I rounded a corner and saw this, I got really excited! They almost paid me to take it, that's how good a deal I got on this table. All it really needs is a good scrubbing and a price tag and it's good to go! Now for the project part of this post. 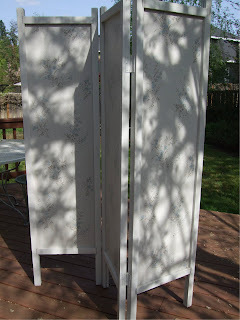 Awhile back I found this cool folding screen on craigslist. (Did I mention, I love craigslist? Oh yeah, I did.) I knew I would cover the existing ugly wallpaper with some of my cool vintage wallpaper. Then a lightbulb went off and I thought, hey, I'll do a patchworky thing with lots of my cool vintage wallpaper. Here is the end result. Now, before you say, "wow, what a great idea!" I have to tell you that I didn't come up with it myself. I borrowed this idea from this amazing artist, who got the idea from this other amazing artist. I'm loving how this turned out. What a tremendous difference a little vintage wallpaper can make, right? I wish I had ten more of these folding screens. This was such a fun and easy project to do. I had all the pieces cut out so all I had to do was set up a little work space out on my deck and get to work. Only took about 2 hours to complete. I was lucky that the frame was already painted white and the back of the panels are painted a soft baby blue so I didn't have to do any painting myself. Well, I gotta run now off to work. Hope you have a fun and creative day! Oh my goodness!!! I LOVE the screen you covered in wallpaper!!! I have been wanting to do that to something but I don't have anything to do it on yet!! You did a wonderful job- it looks gorgeous!!! What a great find that little kitchen table is!! And I love those beautiful barkcloth pillows you made a couple of posts back!! Good for you using you best things- I need to do that, too! Thanks for always being such and inspiration!! I cannot believe how much stuff you find on craigslist! I have a screen that I have been putting off fixing up...what a fab idea! OMG - Just love the paper on the screen. Mostly I love the table. I can see Romantic Roses along the edge!! What a find!! Glad you had a fun day yesterday... The screen turned out awesome, Lisa!! So romantic! And the table is darling... What a find! the screen is really incredible! i love, love, love it! so many wonderful finds...i always love to see what you discover. Ilove that table! Can't believe you could part with it! The screen is my favorite. I am searching for something similar to seperate my guest sleeping quarters from my office and this is the key. Just love it! Oh my gosh! What fabulous finds! I LOVE the linens and I LOVE the way the screen turned out. I can't believe it was easy to do. It looks like it took a lot of talent to get just right. GREAT job! Oh wow you really got great stuff!! I love the patchwork screen. I'm a huge fan of all things patchwork! Very cute table as well. Where to begin...? First off, ain't if GRAND thrifting with your sweet hubby - it's a real blessing...I'm so happy my Baby loves to go with me too!! Secondly, you KNOW how I love looking through your purchases...and I always think, "yep, I'd have wanted that too!" The table is perfection too, BTW...and 75% off is amazing - how could you NOT buy it! OK, thirdly...the SCREEN IS GORGEOUS - I literally gasped as I scrolled down and saw it - you outdid your self girl!!! (of course I HAVE to get a screen now...!!!) Thanks for crediting the artists...I've seen Alicia's blog, but had not seen Pamela's...it's wonderful, and now I have another new creative blog in my favorites! Your finds from the last several thrifting trips have been wonderful too!! Hey, stop by my place when you get a chance...you'll be proud of me and my recent finds from the weekend...you've inspired me to photograph everything and share after a thrifting trip...and I'm having so much fun doing it...look for "Wow, What a Weekend (part 1)"
Thanks for a fun visit, as usual! The screen looks FANtastic, luv it! You did well thrift shopping, the table is very cute. Instead of saying wow great idea I say wow great job,you did it too clean. That turned out so cute! What great finds!! Especially the table. I love the screen, it looks great. Love the bargain on the table. Don't you love finds like that. Great idea for the screen. I'm crazy about it!!! how cool!!! 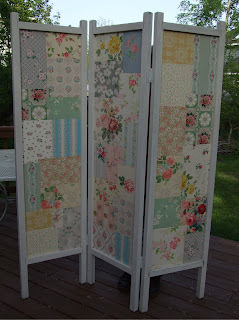 i have a friend that has covered her room divider with atc's that she has collected for her art studio! i DO need to stop by here more often! I love the screen. It looks like a wonderful old patch work quilt! I had a great time with you and your sweetie! I notice you have refinished some funiture. Is it necessary to use a harsh chemical stripper to get the finish off? I really don't want to use a chemical like that but I have heard it is nearly impossible to just sand off finishes. Any help you could give would be greatly appreciated. Thanks! It's great that your husband will go with you-makes evemore fun, huh? I, too love the screen. It is so great to be able to use up bits and pieces of things-plus it turned out darling! Wow! love the screen....just sooooo cute! You did an amazing job. OMG I love the folding screen, that is exactly what I have been looking high and low for. Lucky you! I will think about you next weekend when I trek back to La Maison Rustique. Maybe I can score a folding screen there. That screen is amazing!!!! 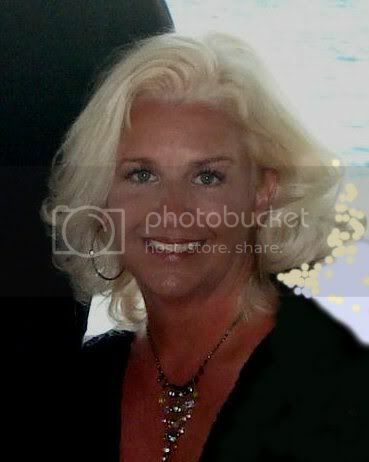 Just beautiful!!!! My husband is a big Craigs List fan...in fact I think he's on it right now!!!! I love love love love love that screen. Now I am thinking I would like to do something like you did but with a mixture of vintage fabrics or vintage images ....OOOOh my gosh the ideas are flowing now. Thank you so much for the inspiration and the kind words in my blog. Happy days to you. Love the screen! Very cute. I have never used craigs list. Might give it a chance. I just love that! what a great way to enjoy and show off a collection of old papers. I was thinking about lining the back of a cabinet with some, but this is even better.